I always plant three or four zucchini plants when I plant in the early spring. When summer comes, I always wonder why I planted so many since one plant will provide a small village with enough zucchini, it seems. So, here I am again in mid-sumer with zucchini coming out of my ears. Every meal these days seems to have zucchini —from Protein Zucchini Muffins after workouts, to zucchini pancakes for dinner. 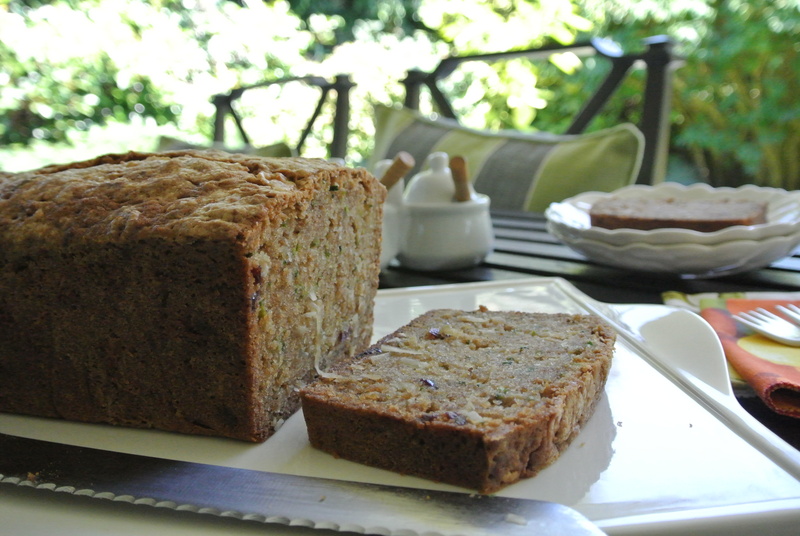 My favorite and easiest recipe is for, of course, zucchini bread. I always like to give my recipes a little kick and with complex flavors. I was trying to come up with new spice combinations and I figured, why not get all of the flavors I need and use Chinese Five Spice? Chinese Five Spice is a combination that is used in Asian cooking combining cinnamon, anise seed, cloves, ginger and fennel seeds, all ground together. This combo is great for many breads and desserts and goes especially well with pumpkin. Butter and line with a sheet of parchment paper, (enough overhang on the long sides so that it will be easy to lift out, butter the parchment paper) and flour 2 8x4 loaf pans or one 9x5 and set aside. Whisk together the flour, spice, baking powder, baking soda and salt in a bowl. In another bowl whisk the eggs, sugar, oil, butter and vanilla together. Gradually whisk the flour mixture into the egg mixture. Then fold the zucchini, coconut and dried cranberries into the batter and mix until well combined. Pour into the prepared pan or pans. Bake in the oven for about 1 hour 25 minutes with the rack in the middle of the oven. Test with a toothpick to make sure that the loaf is fully cooked in the middle. Bake until the toothpick comes out clean. Cool in pan for 5 minutes or so and then remove from pan and cool on a cooling rack until fully cooled. You can store wrapped in plastic wrap at room temperature or in the fridge.